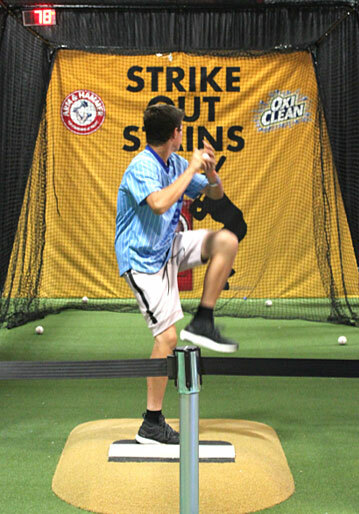 The activations were brought to life in several different ways, as baseball fans engaged with the Arm & Hammer and OxiClean brands through interactive games, free product giveaways, photo opportunities and chances for fans to win tickets to the 2018 MLB World Series. MLB Fan Fest: Created a unique experience for all MLB fans to enjoy for five days inside the Walter E Washington Convention Center. 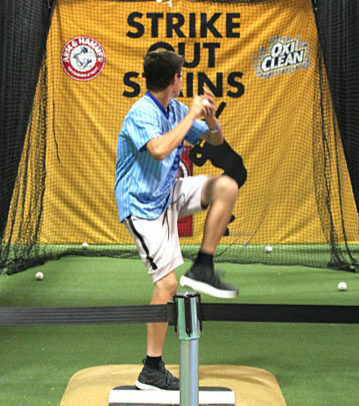 Baseball fans of all ages tested their throwing abilities for both speed and accuracy at the Arm & Hammer and OxiClean Strike Out Stains pitching cages. Highest speed every hour won great prizes, compliments of Arm & Hammer/OxiClean. As crowds swarmed the footprint our emcee engaged some lucky fans with the opportunity to play "Name That Stain." The most accurate and fastest answers were awarded special gifts including gift cards to the online MLB shop. Throughout the days of the show, fans in our footprint were treated to a special "tips & tricks" pitching clinics & meet and greets with Olympic Gold Medalist, Jennie Finch. Jennie is a spokesperson for and "the face of Arm & Hammer". 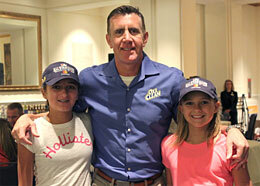 Also joining us at Fan Fest each day was OxiClean's very own pitchman, Anthony "Sully" Sullivan, to provide pitching tips and photos opportunities for kids and adults alike. Nationals fans took pride in their beloved Nationals and took a photo at our Presidents Mascots Photo Op and were asked to share it using the hashtag #armandhammer & #oxiclean. In addition this year we added our famous spin wheel to the footprint. 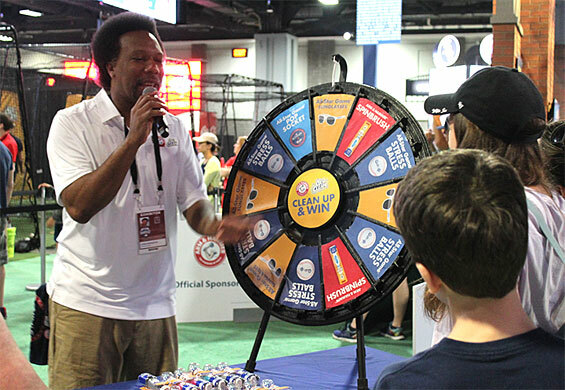 The lines to "Spin & Win" MLB-branded prizes compliments of Arm & Hammer and OxiClean were continuous throughout the entire activation. 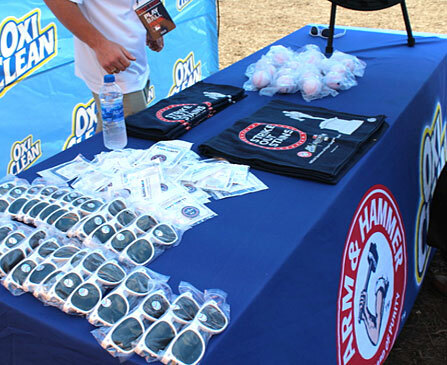 The prizes at the spin wheel included Kids MLB-themed Arm & Hammer Spinbrush toothbrushes, sunglasses, pop sockets, rally towels, and "stress" mini-baseballs. The lines to meet, take a photo with, and interact with "Sully" were lengthy throughout the activation, as fans were also given a complimentary, autographed mini-tub of OxiClean from Sully. Arm & Hammer Truly Radiant toothpaste and samples packs of OxiClean were given out to all fans who came through the footprint, complimentary. Fans also got to enjoy special guest appearances at the fast-pitch cage led by MLB & women's softball legends: Fergie Jenkins, Lisa Fernandez, Cat Osterman, Chad Cordero & Livian Hernandez. Our MC interacted with fans and kept the excitement up all day long! 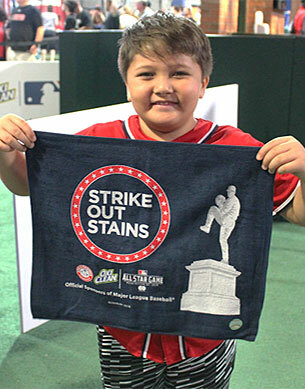 Play Ball Park: Built right outside Nationals Park, Church & Dwight engaged attendees at Play Ball Park, a free interactive activity center for children and families, with the ARM & HAMMER and OxiClean branded "Strike Out Stains Fast Pitch Challenge." 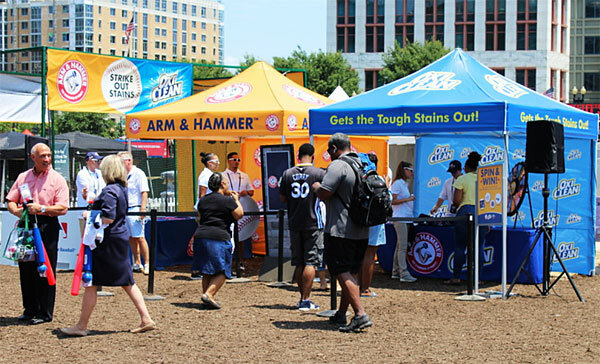 The C&D footprint also included ARM & HAMMER and OxiClean branded tents where fans could take photos with baseball props in front of ARM & HAMMER and OxiClean branded step & repeats. Attendees could also test their luck at the spin wheel, giving them the chance to win A&H and OxiClean and All-Star branded items including sunglasses, pop sockets, rally towels, and "stress" mini-baseballs. Jennie Finch appeared for "Tips & Tricks" session with fans and interacted with fans for photo-ops, and signed sample size containers of OxiClean. Our MC interacted with fans and kept the excitement up all day long! 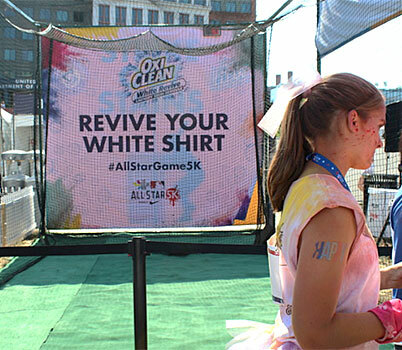 All-Star Color Run with OxiClean White Revive: Church & Dwight teamed up with MLB and the city to put on the All-Star Color Run on Saturday, July 14th. 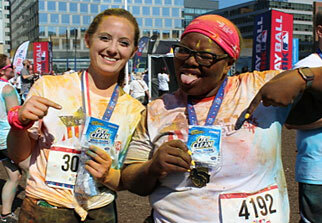 The run benefited local charities, including the National Cherry Blossom Festival in Washington. Play Ball Park served as the start and finish line for the 5K. 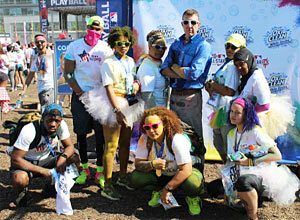 OxiClean White Revive was a sponsor of the Color Run 5K event with exclusive branding of the 'bubbles' area. The C&D footprint was OxiClean White Revive branded and included a GIF booth where fans could take live GIFs and photos with friends and family. 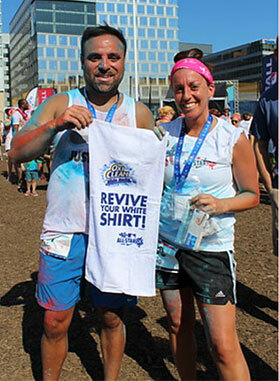 We distributed co-branded cooling towels to help participants cool down in the summer sun. 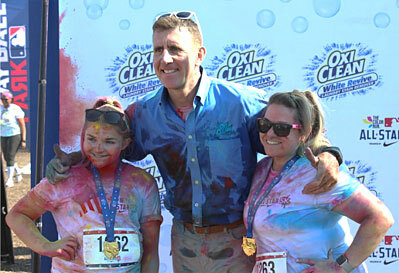 OxiClean spokesman Anthony "Sully" Sullivan ran the Color Run with fans while livestreaming the entire 5K. He interacted with fans for photo-ops, and signed sample size containers of OxiClean. Hospitality Events: In addition to creating fan engagement and brand affinity for Church & Dwight, there were also a group of executives, clients and partners of Church & Dwight who attended the festivities in Washington. This year, we hosted two (2) pre-game and (2) post-game hospitality events for Church & Dwight employees and guests. 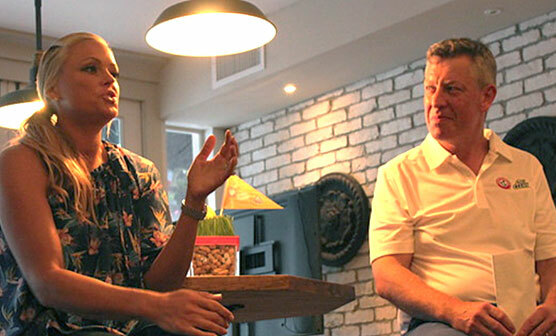 Pre-game hospitality events took place from 3:30-5:15 pm, where guests enjoyed food & beverage along with a Q&A and autograph session with baseball talent. 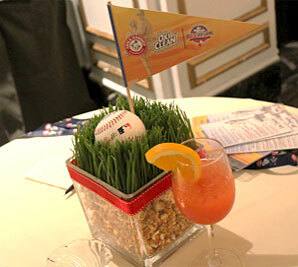 Post-game hospitality events took place after the Home Run Derby and All-Star Game where guests enjoyed food & beverage while unwinding and discussing game highlights. 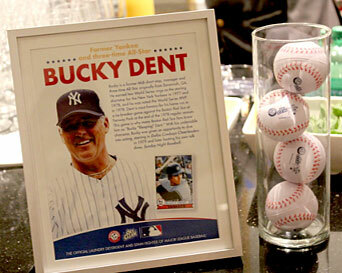 Monday night pre-game: Bucky Dent captivated attendees at The Chinese Room in the Mayflower Hotel with stories of Yankee's past. 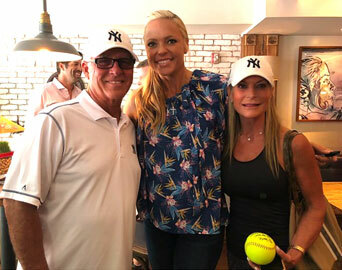 Monday night post-game: Held only a short walk from the stadium at District Winery Tuesday night: Jennie Finch entertained the crowd during a Q&A session at Le Desale's restaurant across the street from The Mayflower. Tuesday night post-game: Held at The Salt Line, which was right across the street from the stadium. Each guest received a welcome gift upon arrival to the hotel with a branded All-Star backpack with ARM & HAMMER and OxiClean branded items including portable charger, hat, pop socket, rally towel, stress ball, sunglasses, sunscreen, bottle of water and box of Cracker Jacks. Full-scale event production at various activations footprints throughout All-Star Week: 150'X100' space at Fan Fest, 40'X30" at Color Run & Play Ball Park. 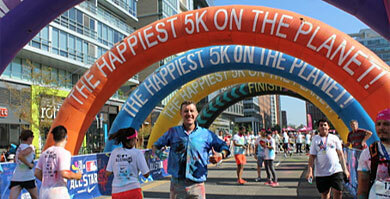 Procure, negotiate and manage onsite emcee, brand ambassadors, fabrication of branded signage. Manage all Transportation details and movements throughout the week for guests. 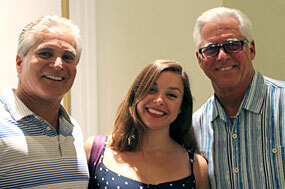 Liaison with MLB/BaAM,/Freeman, The Mayflower on all logistical/hospitality details. Create all programming for fan engagement, emcee scripting at activation footprints and host Q&A's with talent. Spearhead all premium & product sampling distribution.